If you wish to find out which version you are using, click on the "ownCloud" icon in your system tray. Under General->About you should see your version listed. If your version is 2.4 or higher, this should work with ChemBox and you need take no further action. Click on the "ownCloud" icon in your system tray. Under General->Updates you should see a button inviting you to upgrade your version of ownCloud. Click on the ownCloud icon in your system tray and click "Quit owncCloud". Download the latest production package and install it. Start the ownCloud client by clicking on the icon under Applications. 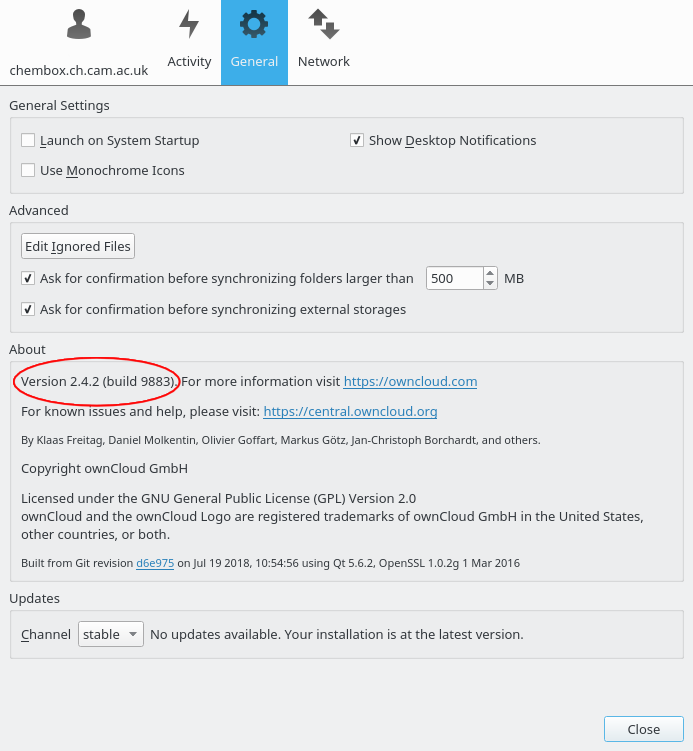 We recomend that you add the ownCloud repository following these instructions. We recommend that you install the client using your package manager. Instructions for adding the repository for common distributions are available from software.opensuse.org .